K walked into our apartment and burst into tears. J followed, and allowed G to pour him several fingers of Dalwhinnie scotch, neat. The couple we'd invited over for meatloaf night -- or actually, an early celebration of National Meatloaf Appreciation Day -- arrived at our home in the midst of a raging fight. Never one to do things by halves, I'd been cooking all day. You'd think it's a simple thing, having friends over for meatloaf night. You just have to whip up a meatloaf, toss together some veg, and there you are. But little by little, a more elaborate version of meatloaf night overtook me. We'd need starters -- can't let people have drinks without something to start. There'd have to be something for dessert, if only because I wanted it. And I wanted mashed potatoes, too, which would then require gravy. G would want collard greens, since they're still in season and well, he always wants collard greens. Suddenly I was preparing a very full-blown meal -- slow-roasted tomatoes on country bread, some cheeses and crackers and nibbles, the main event and sides, and a rustic fruit tart with ice-cream to finish. Then came the really crucial question: what sort of meatloaf to make? My attempts at recreating my mother's meatloaf never quite make the cut for me, and I don't know why, as I watched her make it countless times. I have others that I make, though. There's been a healthy turkey loaf with red peppers, or the Italianate polpettone I've made with tomatoes and herbs and the zip of grated pecorino romano and parmigiano reggiano cheeses. I've even tried a nice meatloaf of Nigella Lawson's with a light glaze of homemade applesauce, which worked surprisingly well. I knew G's vote before we even discussed it. It's been quite a while since I made his favorite Tex-Mex Chile-Cheese Meatloaf, which I lifted from the Julie/Julia project, and which requires your cardiologist to be on call during dinner, especially if G gets his way and I put a slice of bacon on it as well as cheese. But for the present occasion, I had something else in mind -- something classically meatloaf, yet elegant, a bit out-of-the-ordinary, with a haunting, savory gravy. A meal that would look like a blueplate special, but have four-star flavors to leave you craving more. And which would, of course, make stellar sandwiches the following day. I started with three kinds of ground meat, and ended up with a loaf that even as it evoked its kissing cousin, paté, was still and all a meatloaf. I savored the chef's prerogative of a little mini-burger of the meat mixture, which I cooked up to test the seasoning. I loved the smoky, woodsy, meaty flavors. I would even say it had umami. This meant I could leave it in the fridge to await oven time, and then turn my attention to all the other things I'd somehow gotten myself into. By the time our friends arrived, I'd sifted, mixed, chilled, rolled, peeled, chopped, baked, roasted, parboiled, whipped, and was ready to rock 'n' roll, with appetizers already out on the table. "Everything's dreadful," K wept as she sat down on our sofa. The men stayed in the kitchen, and I wondered if we were doomed to an evening of boys on one side, girls on the other, along the lines of a junior-high mixer. Then K caught sight of the platter of slow-roasted tomato tartines (thanks Luisa!) and some nice cheeses on slate boards. "Everything's dreadful," she repeated, "but this makes it a lot better," and she began laughing through her tears. We imbibed various stress-reducing, pleasure-enhancing substances, and things calmed down. I brought the men some hors d'oeuvres, since they were somehow still too shy to come in the living room. As we moved on to the main course, however, the guys were forced to join us; I needed the kitchen table to set out my diner-esque buffet. Everyone served themselves generously and returned to the living room. Slowly, over bites of creamy mashed potato pooled with gravy, the adversarial couple began to exchange shy glances. By the time they'd eaten their way through many slices of deeply flavored meatloaf and extra forkfuls of greens, they were floating a few well-selected but terse words to each other. Then, like a quartet of beached whales, we reclined to watch five back-to-back episodes of Weeds. At that point we served up vanilla-bean ice-cream alongside the tart, which was composed of apples, plums and the last of the season's raspberries. 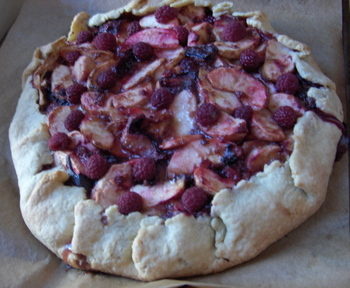 Despite its truly rustic appearance, it was actually so fruity, so flaky, so melting that it deserves a separate post of its very own (you see, I finally managed to make the pastry of my dreams -- but more about that another time). By this time the sparring couple was once again on speaking terms, if not yet billing and cooing. While it had not exactly been the festive and uproarious evening I'd had in mind, all had turned out well. I credit the reconciliation to the food, of course. What other sort of meal could exude such comfort? Friendship is a balm indeed -- but then again, so is meatloaf. freshly ground black pepper -- about 1 tsp. Drain mushrooms, reserving liquid for gravy. Sauté onions and shallots in bacon drippings or olive oil in a large skillet until soft, about 5 mins. Add garlic and sauté for a minute or two. Place the sauté in the workbowl of a food processor, and add the reconstituted porcini. Add bread, eggs, Worcestershire, rosemary, thyme, and all seasonings -- everything, in fact, except the meat. Process until everything is blended. Place three ground meats in a very large bowl, and add the mixture from the food processor. Blend everything together with your hands. Shape into a large, oblong loaf and place in a rimmed baking dish. At this point, you can refrigerate it until you're ready to cook it. Preheat oven to 350F. Put meatloaf in, and cook for about an hour. Test with a meat thermometer, and keep cooking until it reads 150F. Let the loaf rest for 20 minutes before serving. In the meantime, trick out a gravy from the porcini liquid. I used a spoonful of packaged demi-glace (you could use any beef stock or concentrate), a bit of soy sauce, some more truffle paste, cognac and some cloves of roasted garlic I had left from another dish. This was all cooked together, pureed with a hand blender, very slightly thickened with a flour slurry, and enriched with a few spoonfuls of cream. Once the meatloaf is more or less cooked, you can use a bulb baster to suction up the meat juices from the cooking pan, and add them to the gravy. 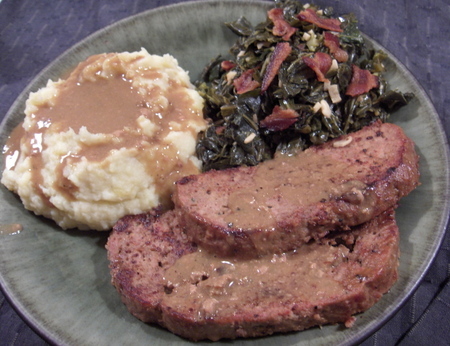 Serve over fluffy mashed potatoes and meatloaf slices. To achieve a true diner look, use the back of a spoon or small ladle to nestle a crater in the top of each mound-like serving of mashed potatoes, and fill with enough gravy to overflow the crater and trickle down the sides. Spicy, crunchy, deep-fried shrimp fritters. Sort of Thai-Vietnamese flavors. Amanda Hesser wrote about these a couple of weeks ago, as part of a polemic exhorting us to make and eat more fritters of any and every kind. Good for us or no, it's really rather refreshing to have someone encouraging us to eat more deep-fried food. She also makes the excellent point that if fried at a hot enough temperature, fritters aren't particularly fat-laden. These were strikingly crisp and quite greaseless for something that had gone bathing in hot oil. It's pretty rare that I jump right on a recently-published recipe and get to work. Usually it simmers with me for some period of time; then I start tinkering with it in my head, and by the time I finally get around to actually making it, my end result may only barely resemble the original. Although this recipe isn't exactly hot off the press anymore, my having cooked it last night (almost exactly as it was writtten, too) represents a fairly short leap from print to reality, at least by my standards. I just had to try them. Puffy shrimp patties with a resonance of fish sauce and ginger and chilies were singing to me, virtually crying out to be made. They occupied a disproportionately large area of my food-imagination head-space for a couple of weeks; all I needed was an excuse, and a particularly beloved cousin's arrival for dinner provided me with one. Deviating from standard operating procedure, which is to mess with everything, I really didn't play around with this recipe. The one change I made was to use a teaspoon of Vietnamese chili-garlic sauce instead of bashing up a dried chili in the mortar and pestle. This recipe is a bit time-consuming only if you do as I did (in the interests of our current household state of frugality), and buy smaller (actually graded "large," as opposed to extra large, colossal, jumbo, mammoth...) shrimp in the shell. Per pound, the little ones are of course going to take more time to shell and scrupulously clean, de-vein and chop. If you're pressed for time and/or not financially challenged, buy shelled and cleaned shrimp, and it will take you almost no time at all. In either case, you can prep this early in the day: clean, chop, mix it all up, chill it and be ready to fry when your guests arrive. Or even pre-fry, as suggested in the article, and have them in a warming oven, which doesn't take a whole lot away from these crisp little devils. My longing to make this helped me conquer my loathing of deep frying, reinforced by recent disasters in this area. Again, I did as Amanda (may I call her Amanda?) suggests, and used a taller, narrower pot with only a couple of inches of oil. This cut way back on spatter, and since I covered the pot as soon as I was finished frying, my home didn't reek of cooking oil either. All I can really say is make them, wrap them up in leafy bouquets of lettuce and cilantro and mint with a squeeze of lime juice, and eat. Eat them right away, and be happy. Whatever else you're serving isn't going to matter much, honestly. We had a perfectly nice spicy hot-pot of soba noodles, chicken, bok choy, carrots and such, but I really just wanted to go back and eat more shrimp fritters. Chopped raw shrimp are sticky, so no batter is needed — a little rice flour holds the fritter together. 1. In a bowl, combine the shrimp, scallion, ginger, chili, fish sauce, sesame oil, salt, sugar and rice flour. 2. In a heavy saucepan, heat 2 inches of oil over medium-high heat. When the oil is hot, drop the shrimp in flattened golf-ball-size patties into the oil. Fry until golden on all sides, turning once, 1 to 2 minutes. Drain on paper towels. 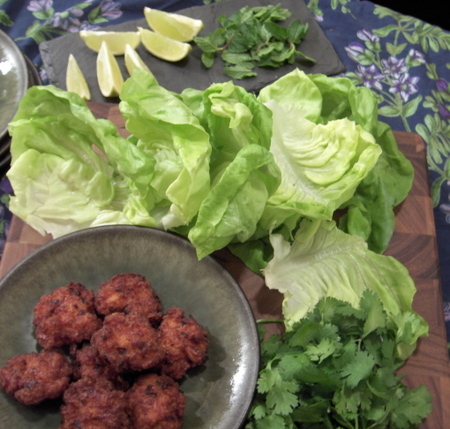 To serve, place a fritter, a cilantro sprig and two mint leaves on a lettuce leaf, sprinkle with lime juice, roll up and eat immediately. Makes about 12 fritters. I ate the last of these for lunch today, ice-cold from the fridge, not even bothering to reheat them -- although I did give them their lettuce/herb wraps and their splash of lime juice. They were delicious cold, too. There are many excellent things about getting married, and even more, about being married (Shauna has known this for more than two days now, and Molly -- girl, you're up next). One of the excellent things that feels slightly embarrassing but is still very lovely is that lots and lots and lots of people want to give you presents. I've never gotten so many presents. We've received gorgeous linens and beautiful dishes and an absolutely fantastic batterie de cuisine, with all sorts of toys that I wouldn't buy for myself, but just tossed onto our registry and voila! people give them to us. Poor, long-suffering G wanted to know why we couldn't register for guitars and amps, but only for household items and of course, the culinary stuff, which, let's face it, are playthings for me. I tried to explain that Crate and Barrel doesn't carry amps, nor does Sur La Table list any guitars for sale. He of course will enjoy the fruits (so to speak) of our new risotto pan (thanks Carolyn and Sara!) and our new pizza stone (thanks Jen and Ross!) and the new stylish glass mugs that he actually picked out for drinking his favorite icy cold root beer (thanks Karie!). But still. The only thing that he really wants to play with is the new crème brûlée torch (thanks Karen & Steve! ), and he still can't understand why I didn't register for his/hers versions of those. But me, well, I'm like a child with a doll's house, as I unwrapped, for the first time in my adult life, a complete set of matching dishes that include serving platters and bowls, sugar bowl and creamer, matching teapot. Gifts still arrive occasionally, some months after the actual nuptials. Most recently a colleague of mine grilled me mercilessly about what we might like that we hadn't yet received. When, after much duress, I mentioned the coveted pasta roller attachment for our KitchenAid stand mixer, she laughed. "Well, that seems like a fitting gift from me," (she's of Italian extraction). It just arrived about a week ago (thanks Lynn!). This nifty gadget rolls sheets of pasta for lasagna, cuts fettucine and linguine as well. I wanted it, I registered for it, I received it, I was immediately filled with trepidation. No matter -- I would just have to face my demons and use the thing, dammit. Somehow the pasta maker felt like more of a commitment than the wedding ceremony itself. After all, G and I had been living together for some years. With pasta, I had never actually made my own; the very idea of it made me feel more like an anxious maiden on my wedding night than, well, my actual wedding night. To calm these virginal fears, I turned to a person on this great good thing we call the internets who, I feel confident, has a rather remarkable handle on pasta. If you don't know the blog The Omnivorous Fish, indeed you should. The author (who goes by the blogging moniker Joe Fish) brings a relaxed and reflective quality to his posts, which are not only about food and its creation but the politics, conviviality and relationships that surround it. Joe is my pasta guru, and I couldn't have chosen a better one. Not only is he extremely knowledgeable, he's kind too -- as my story will demonstrate. Recently I'd been entranced by his posts on gnocchi -- and I still have plans to give the gnocchi a go. But I could not be swayed from my purpose, which was to learn the art of rolled pasta, even if I were going to use a machine for the rolling part. Fortunately, he put up a post about working with a whole wheat pasta dough, which opened the door for me to barrage him with pasta questions. Did I say Joe was kind? Kind, and generous. He responded to my questions by putting up an "Emergency Pasta Addendum" to help me with my pasta issues. If nothing else ever proves the point, these posts show that the great good thing about these internets is that you can always depend upon the kindness of strangers. I won't put up a recipe, since I want to fiddle and play around and experiment a bit. I suspect, as Joe too has said, that the exact recipe isn't as important as gaining a feeling for the dough, for knowing how it feels when it comes out just right. I used the machine for rolling, but followed Joe's advice and cut them by hand, loving the rustic look and texture of them. They were light and ethereal, with almost a "handkerchief" quality -- absolutely worth the work they entailed, just for their luscious texture and their way of absorbing the flavors of the sauce. Perhaps I rolled them a bit too thin for my sauce, a glorious mix of market vegetables and herbs, a bit of cream and sheeps' milk cheese. 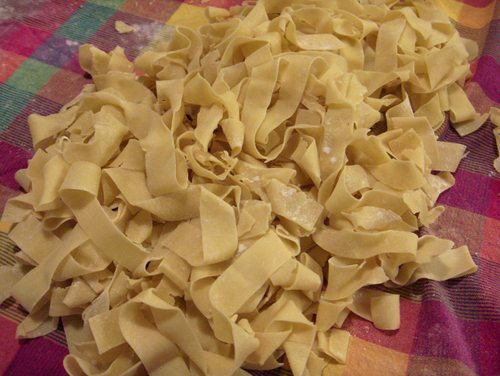 So I'll keep changing things up -- the amount of water I use to get the right feel, whether or not to include salt or olive oil, the thinness to which I decide to roll any particular batch of noodles. And Joe assures us that, as with all good cuisine, experimentation is the name of the game. He too plays with different pasta formulae. In one of his responses to my comment about how it was all going, Joe mentions that he's considering the possibility of giving a pasta class. I know I'm signed up already, even if he hasn't really agreed to do it yet. If you're in the greater NY metropolitan area -- or you're willing to travel-- and you too want to conquer your pasta demons, give this some thought. We might even talk him into doing gnocchi, too. Most Tuesday evenings find me sitting in my FOUR HOUR class for the terrible, horrible, no-good, very-bad administration program (someday someone affiliated with this program is going to read this blog and I'm going to get dooced right out of the class, my job, and possibly my ectoplasm and all other proof of my existence). Most Tuesdays, G is working till late out on Long Island, plying his trade. He picks me up from class, and we get home at about 9:00 pm. So most Tuesday nights, we have soup for dinner. It's good soup; it's homemade soup; it's soup that I've usually made on Sunday afternoon in anticipation of terrible, tiring Tuesday night. A few weeks ago we had minetrone; then there was mulligatawny. Last week it was black bean made on a ham bone. This week I made split-pea/barley/chicken/vegetable. But since, oddly enough, class was cancelled tonight for Halloween, we're not having the soup. I'm not particularly scared of teenagers playing pranks, but then I actually work in public schools. Some folks are scared of that kind of stuff. Thus it was decided that in order for us all be home snug in our beds or helping our little ones harass the neighbors for candy, we should cancel class. So tonight, I decided to cook a real dinner (on a weeknight!) as I wait for G to come home from his Tuesday travails. I longingly perused Laurie Colwin's Halloween menu: the John Thorne pumpkin tian that Lindy mentioned recently in the comments on this post; something called a Wensley Cake; and meatloaf. But pumpkin/squash tian and Wensley Cake would have required a trip to the store. Having gotten home early for a change, I really wanted to make good use of time by slothfully lying around on my bed for a while, having a little snack, reading the rest of the novel I've been toting around lately and playing on the Internets. But I could still make meatloaf, something we haven't had for quite a while, it occurred to me. I had everything in the house. And what's even better, meatloaf would give me something with which to make a plane sandwich for upcoming trip to L.A. I need something sustaining on those long flights, more than Blue Chips and a bevvie, thank you very much. The meatloaf would also provide some of G's meals while I'm away. Usually he makes something he likes to refer to as "The Sandwiches of Abandonment" or "The Soup of Sadness" or even "The Ramen of Loneliness" when I call from far away and ask what he's eating. At least the abandonment sandwich will have some meatloaf in it this time. But what to have with the meatloaf, if no tian is in the offing? Salad is certainly a safe bet. And then it hit me. We'd had lovely baked garnet yams a few nights ago, and there were some leftovers sitting in the fridge. What could be more festively Halloweenish than sweet potato home fries, bright orange and crisp-edged? And alas, no Wensley cake. But there are still financiers and World Peace cookies ( I know you're sick of hearing about those cookies. Just try them), so I took the liberty of decorating one as a reverse Jack-O-Lantern. I'm a little nervous to think what Pierre Hermé or Dorie Greenspan would say about my putting peanut butter on a Korova cookie, but I'll bet it tastes pretty good. I can't really tell you, since we haven't had dessert yet. I can tell you, however, that the salad was green and fresh, and that the yam home fries turned absolutely lush and molten under their crisp exteriors. And the meat loaf? Well, as Laurie Colwin herself said, " [Meat loaf] is nice, homey food, and usually a hit with young and old...it always seems to be good. I have never run into an unlovable meat loaf, but I have loved some better than others." This one is very lovable, I assure you, for Halloween or for any other occasion. "A few years ago I ran into a really delicious meat loaf at Caldwell’s Corner, the premier breakfast and lunch place in West Cornwall, Connecticut. This meat loaf’s winning feature is its texture, which is light and velvety. Naturally I attempted to prize out of David Caldwell (an agreeable, bearded former coffee buyer and father of twins) the secretof his success, which actually may be that of his wife, Alice. The trick is to soak two 1-inch-thick slices of homemade bread (crusts discarded) in 1 cup buttermilk for 20 minutes and stir the mixture into 2 pounds ground chuck with 2 large eggs. The Caldwells make their own bread, but any good, grainy loaf, such as levain, will do. Perfectionists can buy a round loaf – about 7 inches in diameter and about 3 inches high – and cut 2 slices from the middle. (In a pinch, 2 slices of the best packaged bread you can find will do.) It doesn’t matter how you season the meat loaf: Every cook has a different method. I use 1 large garlic clove, minced; 1 tablespoon Dijon-style mustard; 1 teaspoon Worcestershire sauce; and 1 tablespoon ketchup. Sometimes I add a couple of tablespoons of a nice thing called Ortolina, which tastes rather like a concentrated form of V8 vegetable juice. You can buy it in a tube or a jar in specialty food shops. Bake the meat loaf in a loaf pan, 9 by 5 by 3 inches, at 350 degrees F. for about 1 hour." I did a bit of adaption to Ms. Colwin's recipe since, as she says, you must season it as you see fit. Her seasoning is remarkably like what my mother used to use in meat loaf. I mostly did what she suggests, although I used 3 large cloves of garlic, finely minced, and a large minced up shallot as well. I used the ketchup, mustard and Worcestershire, but had no Ortolina, which I've never come across. I added a few big shakes of Penzey's Old World Seasoning and about a tablespoon of smoked chipotle Tabasco sauce. I have a kind of love-hate relationship with cinnamon. It seems to go in phases, from childhood moments where cinnamon toast remains a delectable memory, to the times where a well-meaning but perhaps absent-minded or possibly selectively deaf barista has dusted cinnamon atop my coffee drink, despite my exhortations not to do so. I now loathe it on coffee -- although I occasionally liked it brewed in coffee when I was in college. I like spice cakes and breads and cookies, where cinnamon usually leads the called-for combination of spices. I'm also fond of the Mexican-chocolate or Eastern-European Lebkuchen effect of chocolate exposed to a very small quantity of cinnamon, although some of my family members feel that this spoils chocolate entirely. I often like cinnamon in fruit desserts, but not used to excess, and not with every fruit. I won't, for example, use cinnamon with apricots or peaches, although I will sometimes with plums and apples. People seem to think that a recipe using apples is carte-blanche to throw in spoons of cinnamon, which will, especially if you're using wonderful seasonal apple varieties like Northern Spy or Winesap, completely obliterate all the glorious apple flavor. Just a pinch, just a hint -- that's really all that's needed. The first time I made an apple tart using cardamom and vanilla was something of a revelation; I had discovered that while cinnamon is fine with apples, it's not strictly necessary. I love using just a whisper of it in ricotta ice cream -- not enough to even tell it's there, but enough to give the flavor an indefinable boost. And I like cinnamon very much as a subtle touch in savory dishes; Moroccan and Greek food as well as the late, deeply-lamented Laurie Colwin's favorite company dish of crunchy, oven-baked chicken all come to mind. It just seems important not to use it to excess, especially if one has strong, high-quality cinnamon. This finicky approach of mine is in sharp contrast to G, whose adoration of the spice leads him to crave cinnamon toast made on cinnamon-raisin bread, a longing of his which I indulge occasionally at breakfast or for a snack. And when I make it for him, the scent rises warm to my nose and, often as not, I'll make a piece of cinnamon toast for myself on a piece of plainer bread, since I don't really need or want the double-cinnamon whammy. Probably the best thing I had to eat during my recent trip to Montana was the chocolate chip cookie I received on arriving at my Doubletree Hotel -- which contains, although you might not even realize it, the faintest ghost of cinnamon (that last statement, by the way, is not intended to cast any aspersions on the local cuisine, about which I still know very little, sad to say. It was just that this was a 3-day business trip, with a) no time for searching out restaurants, b) late night work sessions, and c) room-service or hotel-restaurant dinners). Actually, I didn't receive my cookie on arriving. But being a veteran of numerous stays at Doubletree Hotels from San Diego to Tarrytown, I knew my rights. At some point after getting settled, I remembered that I hadn't received my signature warm check-in cookie. So I marched up to the desk to demand (actually to politely ask for) it. It was good. It always is. In fact, it's pretty much the best thing about staying in a Doubletree Hotel -- which is by no means a bad place to stay when you're on business. It's not exactly luxurious, but it's reasonable comfortable and serviceable. And they've got cookies. But they just give you one, although it's a pretty good size. The cookie sets up a serious craving for more cookies, which the nice Doubletree people use to their advantage by having tins of cookies available for sale at the desk. A tin of six cookies costs anywhere from $9.00 to $12.00, depending on which Doubletree you're staying in. Or they're available by mail for $8.95 a tin, plus shipping and handling. Now, the ones handed out by Doubletree are pretty good cookies. I think it's safe to say that they're made with excellent ingredients, since I have a fairly good taste-detector in terms of anything made with a mix or ersatz components. 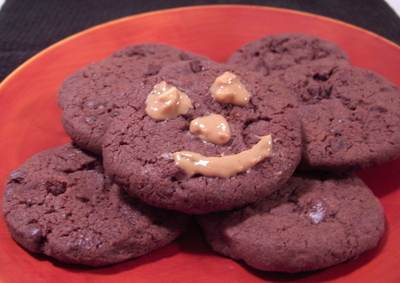 The problem is that it can get pricey to fill a cookie habit like this, once it's initiated. So I restrained my craving until I got back to NYC and googled Doubletree cookies. I found not only online recipes, but discovered that a number of bloggers have made and enjoyed this recipe, whether it is indeed the actual Doubletree formula or not. That was good enough for me, so I made it too. They were very delicious, and did hit the craving spot. In fact, the ones I brought in for colleagues and for my cooking class set up a whole new series of cravings in others. The cooking class availed themselves of the opportunity for some consumer math. 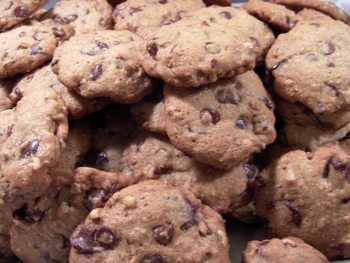 I explained to them that even using premium quality chocolate chips (Ghirardelli) and other relatively expensive ingredients, it only cost about $10 to make 40 very large cookies, comparable in size to Doubletree's. Now that they realize it's possible to make cookies that retail for $1.50 for only 25 cents, they now want to hold a bake sale to fundraise for our cooking class. After a day or so, these cookies aged into being just a tiny bit cakier than I would want; I'm always seeking the holy grail of the crisp-chewy nexus when it comes to chocolate chip cookies. These met that criterion when they were oven fresh, and can recapture it upon a slight reheating. Everyone who tried them absolutely loved them. But for my taste, there was too much cinnamon in the recipe. Mine seemed more cinnamon-y than the original Doubletree cookies, where I didn't really notice the cinnamon presence. You would think that just a quarter-teaspoon would provide that subtle, almost-not-there quality I was seeking. But it was still too much. Perhaps I'm using stronger cinnamon than they do; whatever the reason, if I make these cookies again, I'll cut back the cinnamon. More successful was my recent use of cinnamon in what I am currently calling "the best chili of my career." Every year, as soon the air breathes even its faintest chill, G starts making noises about chili. I like to respect this wish, since for the most part this is a man who eats and appreciates almost any dish I create for our dinners. But chili has had me a bit befuddled. I like it, sort of, but I always find it too heavy. Three spoonfuls and I'm done. I never seem to make the same chili twice, since I'm not usually happy with the results. But this time, using as a template this recipe from Epicurious, I devised a formula which, while not exactly "light", doesn't leave you feeling as if a colony of large heavy things have taken up residence in your stomach and are never going to go away. I have a feeling that part of the secret rests in my having used lean cuts of meat, and ignoring G's pleas for the addition of sausage, which I have often added in the past, but which ups the fat content exponentially. I'm not fond of Cincinnati or "sweet" chili, but I did want a mellow kick to counterpose some of the powdery sharpness of the other spices. Cinnamon was my friend here, providing a flavor balance which neatly tipped the occasionlly acrid notes of chili powder and cumin. Sadly, I have no picture for you, although I'm not sure chili is the most photogenic of foods anyway. We ate this for several dinners, along with my favorite cast-iron skillet buttermilk cornbread and each time we were so greedy with anticipation that I forgot to take a pic. It seems I've finally found a chili recipe I'll save, and make again. This makes a moderately spicy chili, but nothing that will win the kind of competition where the purpose is to burn down through the judges’ esophagi all the way to their stomach linings. Personally, I like spicy food, but I also like to be able to actually taste what I’m eating. Now this is not to say that there isn’t room here for your preferences. If you’re a Texas chili die-hard, leave out the beans. If you eschew the use of tomatoes in chili, eschew to your heart’s content (although the tomato presence here is not noticeable – the gravy is thick but with a meaty, not an acid flavor). Don’t like peppers? Ditch ‘em. Spicier? Add another chipotle or seven, and leave in the seeds. I have full confidence that you can fine-tune this one to your likes, and find it just as delectable as I did. Heat oil in large Dutch oven over medium-high heat. Add beef and pork to Dutch oven in small batches and sear well over high heat. Cook over medium-high heat until no longer pink, stirring occasionally, about 10 minutes. Transfer mixture to bowl, using slotted spoon. Add 2 onions, bell peppers and garlic to pot and sauté until tender, about 12 minutes. While sautéing, add in all the dry spices: chili, cumin, coriander, cinnamon and oregano. Return meat mixture to Dutch oven. Add tomatoes with liquid, coffee, Tabasco, and chipotles. Season with salt and pepper. Cover Dutch oven and simmer until beef and pork are almost tender, stirring occasionally, about 1 hour. Add beans to chili. Simmer uncovered until beef and pork are tender and chili thickens, about 30 minutes. Adjust seasoning. Ladle into bowls. Serve, passing cheese, cilantro, and sour cream separately. Best accompanied by a hot pan of cornbread. It all started a couple of months ago when I realized that Zarah Maria and Martin were planning to spend far too brief a time in New York during their fairly pretty comprehensive tour of the US. I simply couldn't allow my city to be given short shrift. For certain questions, it's wise to choose your time carefully. Sometimes early morning (when your partner is still curled in fetal position and his consciousness level is questionable) is best: "Honey?" "Mmmphh." "Can we have some food bloggers from Denmark -- well, actually, a food blogger and her boyfriend -- come stay with us at the beginning of May?" "Mmmph. Sure." Later that same morning: the aforementioned partner is now both vertical and ambulatory, and has even had coffee, but this doesn't necessarily mean that the level of consciousness is particularly elevated : "Sweetie? Do you remember that I asked you earlier if Zarah and Martin could come stay with us?" "Uh huh. Sure. No problem." Sometime during the afternoon of the same day: "Did you ask me before if some people could come stay with us?" "Yeah, Zarah and Martin from Denmark. You said yes." "And you know these people how?" "I know Zarah through food blogging. We've been corresponding for quite a while, actually." "Wait. Wait. You mean you've never actually MET these people and you've invited them to come stay?" Despite repeated mutterings and dire predictions, Zarah and Martin (after an annoying mishap detailed by my dear chum Bakerina here) did indeed come to stay, and a lovely time ensued. I was deeply embarrassed by the fact that I didn't cook for them even once during their 3 days with us, but in my own defense, I a) had just returned from San Diego, and b) had to immediately start a rather challenging work week. Food shopping and meal planning were not in the cards, nor were extended guided tours of the city. What we were able to offer was housing, and a couple of evenings together, which turned out to be very lovely. Conversation and laughs never lagged, even for a moment. On their last night in the city, after a walk-through of Kalustyan's Market and a spin through the closing farm-stands at Union Square's Wednesday Greenmarket, we took them to a little Moroccan dive in the East Village, Cafe Mogador, a place I've seen through many changes and of which I've remained a devotee. Tuesday night we were all up to our own devices, since G was working late, I had a late class and we wouldn't be around at all until bedtime, more or less. Zarah and Martin showed up even later, whereupon we learned that after yet another inexhaustible day of walking the length and breadth of Manhattan, they'd taken themselves off to Les Halles, where they bathed in Bernaise sauce and enjoyed peerless frites with their steaks. But on their first night, Monday, ah Monday, our guests insisted on hosting us at the Bread Bar, which as readers of this site know, is one of my chosen places and G's absolute, world-without-end favorite restaurant, at least in NYC. It was on Zarah's must-try list for their New York visit, so off we went. I always think that good restaurants know how to strike a balance between keeping enough of your favorite tried-and-true treats to draw you back, as well as enticing you with new things to try. This time there were several new cocktails as well as new dishes on the menu. We ordered lavishly, drank, ate and got acquainted. One new item (or at least new to us) was the Cauliflower Caldin, described as a Goan coconut curry. I hesitated, knowing G's distaste for coconut. I've broken down many barriers in the past few years. Successes include rhubarb, lamb, leeks, and yogurt-based sauces. Still in the column of hated foods are raw onions, avocadoes, olives, mushrooms, and, I had thought, coconut. But G affably agreed to this dish. It dawned on me that recently he's eaten and enjoyed coconut-based curries in Thai restaurants, as well as my own coconutty version of mulligatawny soup, and the coconut rice that Luisa brought to my attention. When I teased this out with him a bit, he told me that he still doesn't like coconut itself: the texture, the shreddiness, the getting-caught-in-your-teeth quality of it. 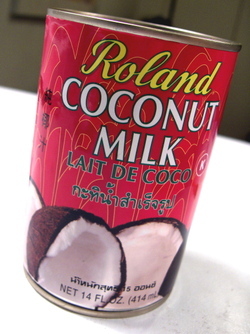 But he now likes the flavor of coconut or maybe coconut milk, at least in savory dishes. So much so that as he was scraping the bowl of cauliflower coconut curry at the Bread Bar, he suggested that I make something like it at home. "This would be good with that coconut rice you made a while ago," he said. He was asking for two coconut dishes? In one meal? Last night's dinner was the first time I've done any real cooking in more than a week. My own bastardized version of Nigella's chicken tikka was on the menu, as was some spiced naan we picked up at Kalustyan's. But the piéce de resistance was the cauliflower coconut curry, served over coconut rice. My only question is, if we can conquer coconut, can mushrooms be far behind? Sadly, I think I know the answer. To borrow a very little from Jane Austen, it is a truth universally acknowledged that there are few things as lovely as a good dinner with good friends. (Single men and their fortunes notwithstanding.) Especially there are few things as lovely when it's Nathalie and Josh who are coming to dinner. I've known Nathalie ever since we spent a few years sharing a brownstone floor-thru in Brooklyn. Like all roommates who become true friends, we came to know each other's histories and on-going dramas: families, first loves, divorces, disaster dates, heart-throbs and break-ups. We shared meals of cheap Chinese take-out and tossed back margaritas at our Mexican local. We did have many things in common; it was, however, the moment where she told me about being chased by a wild boar while foraging for mushrooms in the forest that caused me to realize our childhoods had been quite different. I was lucky enough to live with Nathalie's heartstopping, other-worldly canvases for several years. She came with me to my parents for many a Thanksgiving as well as other celebrations; I went to France and spent glorious times at her family home in the Cevennes Mountains with her remarkably warm, forthright and large family, sitting over lovingly cooked lunches and dinners as bottle after bottle of sturdy red wine was opened. Time passes, lives change, and of course neither of us live in that Brooklyn brownstone any more. We each have our mates, as well as work and family obligations that demand a fair amount of time. But we do love to get together, and the synergy is always good. Nathalie and her husband Josh are just as fond of good food and wine as we are; Josh (an amazing jazz musician) and G have much to talk about music-wise; and once we've all got a glass or two under our belts, our evenings generally start to devolve into the sort of ribaldry and silliness that lets you know you're truly among friends. I wanted to make something really good when we invited them for dinner. For all the right reasons -- not to impress or flatter -- but simply to give pleasure. I know that Nathalie is always hoping for lamb when they come to dinner, and I'm always happy to oblige since it's a favorite of ours too. I thought about Rogan Josh or crisp herbed lamb chops, but settled on Gardiane, a stew from the Camargue which is variously listed as being made from beef, veal, lamb or the meat of bulls, wherever that might be found. I love the version from Mireille Johnston's lovely old book The Cuisine of the Sun, a forerunner to the explosion of French provincial cooking in this country. The late Ms. Johnston's Gardiane uses lamb, as well as copious amounts of garlic, some orange zest, and the one ingredient all recipes for this dish seem to agree upon -- olives. G graciously agreed to pick the olives out of his portion. He's always gracious about such things -- even about the extra dishes that come with having guests. G and I had just popped out of our showers and become nominally respectable when the doorbell rang. Nathalie exclaimed over the good cooking smells, so I showed her what was in the big blue pot. "Oooph, La Gardiane, bien sur!" she exclaimed. "It's a great dish from the Camargue!" Sometimes I forget that in France people really do know their food. Drinks were poured, and we went into the living room for apps. I kept appetizers easy -- more olives, crudites, G's beloved Manchego cheese (to make up for all those olives), some nice fennel-scented taralli biscuits, and my most favorite party trick of late: Nigella's Parma ham bundles, which consists of a small chunk of moist dried fig (I cut mine in quarters) smeared with fresh goat cheese and wrapped in prosciutto. A simple thing, and quite addictive -- I made them for my friend Katherine's party last fall, and people were impressed out of all proportion. We moved on to La Gardiane, a fresh baguette, and a simple green salad: butter lettuce, baby romaine, arugula and avocado. Nathalie and I switched from the white wine to the red, and Josh and G finished their Glenlivets so they could partake as well. I really can't quote the conversation at this point, since what I remember of it began to get quite raucous. Suffice it to say that the lamb dish, which had been cooked gently with garlic and thyme, orange zest and olives, and included tiny carrots and little creamer potatoes that had simmered to tenderness in their jackets right in the sauce, was a success. The salad too was good, as salad always is after such things. Little by little we made our way to dessert. Nathalie and I cleared plates to the kitchen. She looked fondly back over her shoulder as a shout of laughter came from the living room. "When we were in that Brooklyn apartment, we never thought to be here, now, like this..." she said, looking pleased. I always think that unless you know for a fact that your guests don't have a sweet tooth, dessert is a real priority. 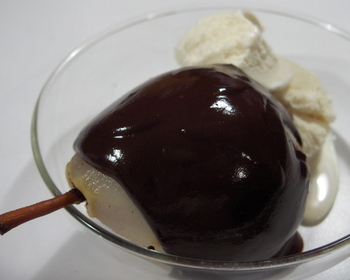 You can always buy a lovely dessert for a dinner party, but there's nothing like creating something yourself. After all, you end with dessert, so that's where the evening's memory lingers. Because I couldn't quite fix on chocolate, vanilla, nut or fruit, I decided to make something that would encompass all those good flavors. I'd never made a panna cotta before, even though it's a dessert I love. Vanilla bean simplicity was what I wanted, surrounded by a lovely fruit compote. My citrus loves of the season, cara-cara and blood oranges, were in the starring role, garnished with fresh although out-of-season berries that I simply couldn't resist. The oranges were supremed in all their colorful glory, and their juices reduced with jasmine-perfumed thousand-flower honey and a splash of Grand Marnier. This was drizzled over the orange sections along with a dose of blood orange vinegar and some grated orange zest. Left to sit for a while, the orange sections were finally joined by their garnish of berries. Then each ramekin of vanilla-speckled panna cotta was upended into a ring of all that lovely fruit. Fruit and sweet vanilla cream are almost perfect -- but they do need a little something to go with, as far as I'm concerned. I'd been inspired by Molly's post of chocolate madeleines, and wanted to try my hand at my own version. Mine ended up being quite different from hers, with resonances of the Pierre Hermé chocolate loaf cake I made a few weeks ago, rich with chocolate, almond paste and lots of crisp pistachios. Instead of using Molly's luscious chocolate glaze, I included a goodly amount of chopped dark chocolate inside. 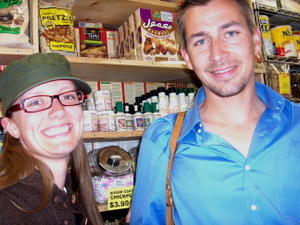 Our dear friends were suitably wowed, and especially pleased when they went home with a bag of madeleines for "laters". "Just when I thought I was out, they pulled me back in." There's an art to creating the perfect menu for a television event that looms large. For some people, their Superbowl menu is the crowning achievement of their own version of television-dinner theatre. For others, it's Oscar night, and the menu they'll create for an Oscar party. At our house, it's dinner á deux with the Sopranos. For weeks, I rack my imagination to find the menu that will be just right for the season finale -- or, like tonight, for the new season's first episode. Tonight is a special case, of course. 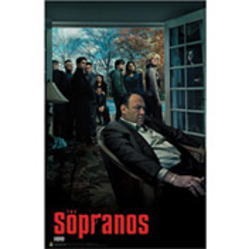 We and the rest of the Sopranos-addicted world have been waiting for, count 'em, twenty-one months. No surviving television program has ever made an audience wait that long between seasons. And sadly, this is probably what we love about this show. Like its main character, the show can get away with its own arrogance. The Sopranos know that even if we try to get out, they'll pull us back in. Back to dinner; what to make? Fortunately, the show is rife with meals both eaten and described. I've long toyed with the idea of making either Carmela's famous baked ziti or her lasagna, lovingly described in several episodes. When G weighed in on the question, lasagna was the clear winner, since it's a favorite of his. The Sopranos industry has come out with a new cookbook, Entertaining With The Sopranos, a follow-up to their best-selling The Sopranos Family Cookbook. I don't own either of these, since from the samples available, the recipes appear to be fairly mainstream and similar to others that could be easily obtained through other sources. However, in the interest of being faithful to my obsession, I did some searching and found reprints of "Carmela's Lasagna." Honestly, I wasn't impressed with the recipe. I have a feeling that Carmela would do better than that, so I set out to create my own version. The problem is that I'm a big fan of Lasagna Bolognese, which uses a bolognese-style meat sauce, besciamella (or bechamel) sauce, and Parmesan cheese layered with lasagna sheets. G, however, favors the more popular American-style lasagna, based on Lasagna Napoletana, with layers of ricotta, mozzarella and sauce al ragú, a long-simmered "Sunday Gravy" style red sauce. This, admittedly, would be closer to Carmela's lasagna, since the family is originally from Avellino, near Naples. 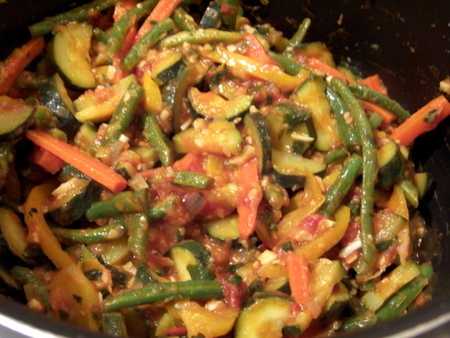 Carmela's version of the dish is described by Bobby Bacala in Season Four, Episode Five: Bobby raves to Uncle Junior about what a good cook Janice (who's putting the make on the recently widowed Bobby) is. Junior, having known what a manipulator Janice is since she used to steal from his wallet as a little girl, tries to disabuse Bobby of his illusions. He tells him that the lasagna Janice is serving him is clearly Carmela's doing, since it has her signature "sweet sausage and the basil leaves under the cheese." Bobby won't hear it, since Junior "always thinks the worst of everyone." Meditating on Carmela's lasagna led me to wonder exactly how Janice got the pan of lasagna (and whether or not, if I lived in an alternate television-based universe, I could get one too). I'm not sure that Carmela would cooperate with Janice's scheme to win Bobby over by making a pan of lasagna for her. Carmela might, however, have made it as part of being on "Ziti Patrol", which is when the wives take turns feeding the household of someone who's had a recent loss -- a fairly frequent occurrence in their circle, of course. In that scenario, she would have given it to Janice to take over to Bobby's. Janice would then have palmed it off as her own, which is not at all unlikely. Another possibility is that Janice might simply have stolen a tray of lasagna out of Carmela's freezer. I wouldn't put that past her, either. After all, we're talking about a woman who stole someone's prosthetic leg. I finally decided to create a hybrid. I 've made my own sauce Bolognese instead of ragú, but with sweet sausage in addition to the beef and prosciutto. I'm going to forego my beloved béchamel, and use the many kinds of cheese so dear to G's heart, along with some fresh basil tucked into the layers. And although I don't have a pasta machine, I did search out fresh lasagna sheets, so the result should be good. I'll let you know what "the boss" thinks later on, when I serve it up with garlic bread and salad, and later on, cannolis. Let's hope it's a dinner as well as an episode worth waiting 21 months for. Heat oil in heavy large saucepan over medium heat. Add onion, carrots and garlic; sauté until softened, about 10 minutes. Add prosciutto or pancetta and sage; sauté for a few more minutes. Break up sausage and saute with other ingredients until browned. Add ground beef to the pan and sauté until cooked through, breaking up meat with back of spoon, about 5 minutes. Add vermouth or wine, and cook until the liquid boils away. Add remaining ingredients. Cover and simmer until flavors blend, stirring occasionally, about 1 hour. Discard bay leaf. Cool. Preheat oven to 350°F. Cook noodles in large pot of boiling salted water until almost tender, about 3 minutes. Drain; lay out on lint-free dishtowels to absorb as much moisture as possible. Combine ricotta and 3/4 cup Parmesan cheese in medium bowl. Mix in spinach, parsley and nutmeg. Season to taste with salt and pepper. Mix in eggs. Spread 1/2 cup sauce over bottom of 13x9-inch glass baking dish. Place a layer of noodles over sauce, overlapping to fit. Spread half of ricotta-spinach mixture evenly over noodles. Sprinkle chopped basil evenly over ricotta-spinach mixture, and then top with 2 cups mozzarella cheese . Spoon 1 1/2 cups sauce over cheese, spreading with spatula to cover (sauce will be thick). Repeat layering with 5 noodles, remaining ricotta-spinach mixture, basil, 2 cups mozzarella and 1 1/2 cups sauce. Arrange remaining 5 noodles over sauce. Spread remaining sauce over noodles. Sprinkle remaining 3/4 cup mozzarella cheese and 1/4 cup Parmesan cheese evenly over lasagna. Cover baking dish with aluminum foil. Bake lasagna 30 minutes; uncover and bake until hot and bubbly, about 30 minutes more. Let lasagna stand 15 minutes before serving. Serves 8-12, depending on appetites. Postscript: This was absolutely sumptuous, but made far too much for a 13x9 inch baking dish. Either you'll need a much larger lasagna pan, or else you can do as I did and make another smaller dish of lasagna for the freezer. Zorba came upon an old man planting an apricot seedling and asked why he, an old man, was planting a new tree. "I live as though I would never die," was his reply. "And me, I live as though I might die tomorrow," said Zorba, "which one of us is right?" I like to think that I live as both the old man and Zorba -- especially when it comes to apricots. I plant metaphorical apricot seedlings for the future, and eat as many apricots as I can today, since I don't know what tomorrow may bring. Right now, in the depths of early winter, I find myself with severe cravings for the golden acid-sweet burst of an apricot. I've always loved them. I love the blush-sweet image they conjure in my mind, little orbs so glowingly peachy, but with a tad more perfume, a bit more piquant bite. I love the words for apricot in other languages: abricot in French, albaricoque in Spanish, and my favorite of all, Arabic -- mishmish. Mmmmmm.....mishmish. I'm sure that I didn't read Collette Rossant's gorgeous memoir with recipes, Apricots on the Nile, merely because of its title...but then again an evocative title is certainly part of what draws us to a book. As a child, most of my apricots were eaten dried, since we never seemed to get good fresh ones. These days, with the happy advent of farmers' markets to our cities and fresh local produce at our fingertips, I revel in apricot season. It seemed to run almost through the entire summer this year -- from mid-June through August. I made a tart, a cake or two and developed a passion as well as a recipe for apricot curd. Mostly, though, when they're fresh and seasonal, I eat them as they are -- hopefully with perfumy juices dripping down my face -- but even when they're not that juicy, quite happily. But it's January, and so I'm back to my old friend the dried apricot. I toyed with the idea of slow-roasting our New Years' Eve shoulder of pork with apricots -- but knew that G, that inveterate apple fan, would be wishing for spiced sauteed apples with the roast, and I didn't want to disappoint. Instead our sweet course to ring in the new year was a spin on bread-and-butter pudding that was light, pillowy, creamy as a dream -- but with a lusty apricot tang. I unearthed the last jar of apricot curd I'd frozen back in August and plumped up some of my favorite French dried apricots from Fairway with a nice splash of Grand Marnier. Then it struck me -- the golden pandoro I'd bought some weeks ago, taken a taste of and promptly abandoned could be put to good use here. So the pandoro was sliced, buttered and spread with apricot curd (you could easily use apricot butter or good apricot preserves here too), layered in a buttered dish with snipped apricots plumped in Grand Marnier, and then covered with a custard of eggs, more cream than milk, not too much sugar, and a liberal grating of nutmeg. I baked it until just set, about 40 minutes, and it was quite perfect -- and even better on New Years' Day. But that was not enough to satisfy my midwinter apricot mania. The same book I mentioned earlier, Apricots on the Nile, had provoked the idea of an apricot flavor insinuating itself into more savory fare -- specifically, Ms. Rossant's description of and recipe for delicate little lamb meatballs in an apricot sauce. That recipe remains for the moment in my mental to-try file, since I'm just a little iffy about meat-and-fruit combinations. In the meantime I happened across a recipe for linguine with apricots. At first glance, I dismissed it. Pasta in a fruit sauce? Must be dreadful. But I went back for another look. There's practically as much garlic as apricot in the recipe, as well as olive oil, dry white wine, rosemary -- lots of savory counterpoint to the sweet tang of the fruit. I realized that the reason I don't like most sweet-and-savory combinations is that the sweet too often outweighs the other flavors. I can't stand my sweet potatoes with sugar or syrup or even sweet spices. Their natural sweetness needs no heightening -- instead it demands the contrast of salted butter and plenty of pepper, to my palate. In anything other than outright desserts, a whisper of nutmeg is reserved for savory potato and spinach dishes, hints of cinnamon and allspice for tagines where cumin and garlic balance the sweetness of the other spices. In this recipe, apricots are the only sweet element, playing against other sharp and savory flavors. I decided it had possibilities. So tonight I gave pasta with apricots and garlic a spin. Magic. I let the apricots simmer in the garlicky, winey olive-oil broth until they began to melt into the liquid. Then the sauce was tossed with hot linguine and sprinkled with fresh chopped parsley. It still needed just a little something, so toasted pine nuts were sprinkled over. My mind prohibited grated cheese at first, but I knew that when G saw pasta, he would probably want cheese. Then I thought of fruit's natural affinity for cheese -- and it occurred to me too that these apricots were, in a way, operating as if they were simply slightly sweeter tomatoes in the sauce. A bit of freshly grated pecorino romano was a delicious if not strictly necessary addition. And so I live not just for time to come, nor solely for today -- but to taste apricots and conjure summer while enjoying winter as well. I hope too that all of you are enjoying your favorite aromas and tastes as you enter a new year that will hopefully bring us all closer to the future, as well as inviting us to live right here, right now. Preheat the oven to 350 degrees F. Butter a shallow baking dish with a capacity of about 1 1/2 quarts. Put the chopped apricots in a little dish and sprinkle the Grand Marnier over and leave them to macerate. Make little sandwiches with the pandoro, butter and apricot curd or jam; there may be some butter left over to dot on the top later. Now cut the sandwiches in half or even quarters to facilitate fitting them into your dish; arrange them evenly along the bottom of the dish. Sprinkle over the apricots, tucking them into the spaces between the little sandwiches. Sprinkle over any unabsorbed liquer that remains in the bowl. Whisk the eggs and egg yolk together with the sugar, and pour in the cream and milk. Add the vanilla and nutmeg, and mix all together well. Pour this over the bread sandwiches and leave them to soak up the liquid for about 10 minutes, by which time the pudding is ready to go into the oven. Smear the bread that is poking out of the custard with the soft butter. Place the dish on a baking sheet and put in the oven to cook for about 40 minutes or until the custard has set and puffed up slightly. Remove and let sit for 10 minutes before serving. Heat the olive oil in a skillet over medium heat. Add the minced and slivered garlic and sauté until just browned. Stir in the white wine. Reduce the heat and simmer uncovered for 5 minutes. Add the rosemary and apricots. Season with salt and pepper to taste. Simmer for about 15 minutes, until some of the apricots start to dissolve and the sauce emulsifies. If the oil stays separate, stir a little hot water in to encourage the emulsion. Cook the pasta al dente and drain, reserving 1 cup of the pasta's hot cooking water. Use as much of this as seems necessary to loosen and re-emulsify the apricot-garlic sauce. 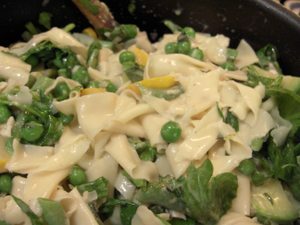 Place the pasta, sauce, parsley and chives in a large serving bowl and toss to coat. Sprinkle with toasted pine nuts. Pass grated cheese at the table.